Are you held bound by limitations deterring you from living life to the fullest? Do you desire to fulfill God’s plan for your life or develop a closer relationship with God? Sorting out There are questions unanswered, mysteries unexplained, challenges unresolved, identity crisis and heart felt issues that cannot be shared close friends and even family. At the sorting out prayer conference, you will find answers to your unending questions exclusively from the Bible, you will meet with God in plain light and have an opportunity for a fresh start. It’s time to take control of your destiny and reconnect with purpose at the July edition of the Youth Sorting Out Conference with Rev. Joe Olaiya of Living Faith Foundation. Sorting Out is a unique powerful and spiritual 3 days residential conference with the aim of facilitating a personal encounter with God. Sorting Out provides a one-on-one counselling for every one that attends a Sorting Out programme. “I had been stammering for as long as I can remember. During the prayers at Sorting Out, I just realized that my tongue had loosened, and now I can speak very clearly.‎ I’m very happy because the disability has denied me several opportunities in life. God works wonders at Sorting Out.” -Elijah. A.
Rev. Joe Olaiya expressly teaches liberating insights from God’s word and provides targeted ministration and counselling to help you out of life difficulties at the conference. Testimonies abound from past editions. 1. 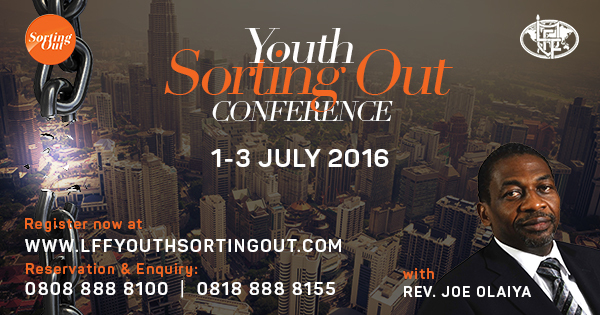 Call the Youth Sorting Out Team on 0818 888 8155 , 0808 888 8100 to reserve your accommodation. 2. Make your payment for accommodation with your name as reference and send confirmation to 0818 888 8155, 0808 888 8100 or email info@lffyouthsortingout.org. At Orchid Hotels Plot 3, Dream world Africana Way, Onigbogbo Layout, Lekki Epe-Express Way, 2 minutes drive from Chevron Roundabout, Lekki 101245 Lagos, Nigeria.